In early 1999 I found myself in Taiji, Japan working on a marine mammal acquisition for the Beijing Aquarium. The conservation ethics surrounding “The Cove” are another story deserving its own chapter at another time. While we were working at a Dolphin encounter resort on the outskirts of Taiji, we were staying in a fishing community just to the north called Katsuura. Every day we drove past the waterfront in Katsuura through the bustle of activity around the fishing markets. On one of my few days off, I visited the market to see what was being caught and auctioned. The sheer number of top level predator fishes that were laid out in organized stacks in the football-field-sized warehouse space was amazing. Tuna, mackerel, billfish and ocean sunfish made up the bulk of the daily catch. There were also several piles of shark fins stacked 4’ high and spreading over perhaps a 12’ diameter area. I couldn’t locate any shark bodies in the entire market area, just three or four large heaps of fins. 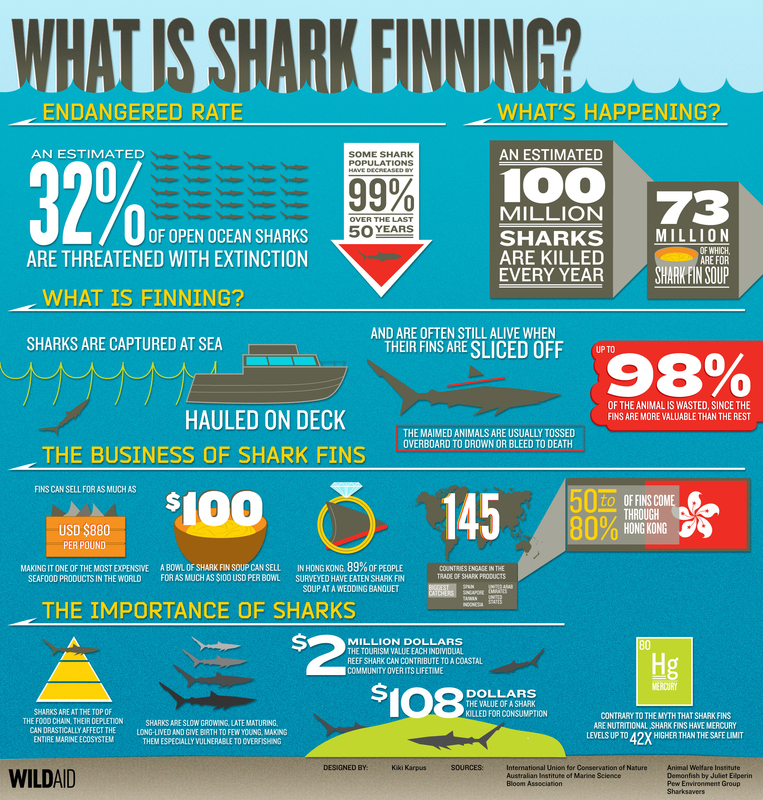 The shark finning problem had not been as apparent back then, but the lack of carcasses hit me as a tremendous resource waste in a culture that had up to that point appeared contrary to such practice. We were scrutinized by neighborhood mama-sans for not removing all recyclable materials from our trash. The few occasions where we ventured through the Taiji waterfront were an incredible lesson in efficiency where the harvested dolphins and whales were carved up for consumption with nearly no waste evident. How could a people so intimately linked with existing on the natural resources of the sea be so wasteful of their harvest? It wasn’t until I later learned of the international demand for shark fin soup, that I fully understood what I had encountered in Japan. Over the course of 3 months, we passed the Katsuura waterfront market daily and a subliminal counter was clicking in my mind. Six days a week, thousands of tuna, dozens of billfish and those uncountable piles of shark fins every day, rain or shine. Between the seemingly unscrupulous harvest of entire pods of cetaceans in Taiji and the daily take of finfish in Katsuura, the efficiency of removing these natural resources was mind numbing, and the ocean’s ability to sustain this level of take was something I struggled to understand. On one spring morning shortly before our departure from Japan with our dolphins and whales, we had some free time to explore the area. We happened upon a complex of houses a few streets behind our own that was a processing facility for shark fins. The entire area was perhaps an acre with a large open space between 3 houses. The central yard space was filled with 3 tiered clotheslines with two horizontal racks beneath them. Shark fins were hung on the lines like laundry and all of the horizontal shelving was filled with trays containing drying fins 4 or 5 deep. There were lines strung between the houses, both first and second stories with similar triangular, gray fins hanging in the sun to dry. The entire roof surfaces of all 3 houses, including the shorter sheds attached to them, were completely covered with shark fins of all sizes, looking like roof tiles. There were 2 vans parked in the driveway that were completely stuffed with baskets of dried shark fins inside, and completely covered with drying shark fins on top. My Australian buddy Wayne and I took pictures and tried to count just a small portion of what we were seeing, but couldn’t even begin to estimate how many sharks were represented by what we saw. There were likely 10,000 fins drying at that one complex the day we happened upon it. The staggering thing is that we went back a few days later and there was a completely new batch of fins being processed. Get schooled about SHARKS at #SharkUWeek at Moody Gardens!